Today is the last Tuesday that I will be starting work a little later (10am start). After that I start at 8am on Tuesdays. It's along story, but that's just my work schedule in the summer. Today I decided to take advantage of the early morning and invite my friend Brad out for a sunrise search and destroy fluke mission. We left at 5:30am and were fishing in the river by 6. It didn't take long to start bringing in the fluke using my Wonder Rig. Brad started by using a jig and shortly abandoned this method in favor of mine. It's just that good. We found some really nice holes that produced some quality fish. 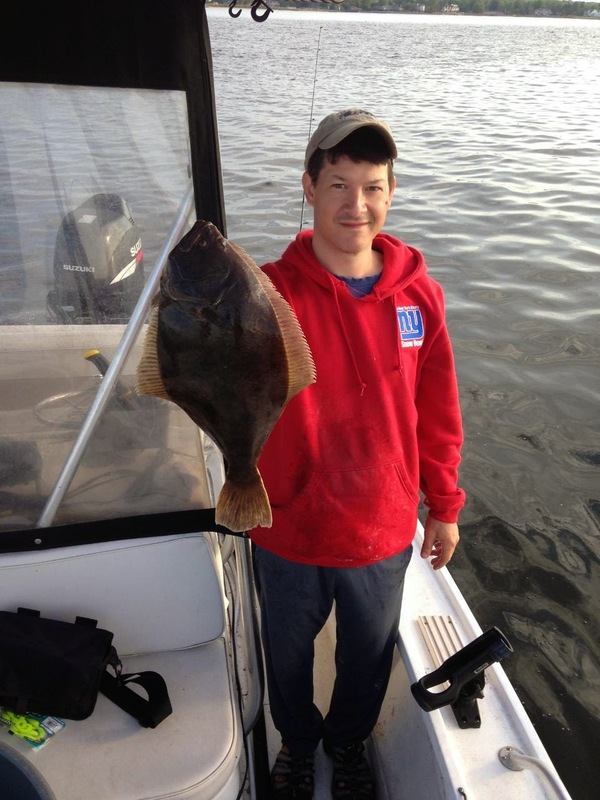 In under 2 hours we were finished and had about 7 very respectable fluke and one bluefish in the livewell. We also threw back several fish that we just about a half inch short. I landed the largest fluke of the year today - a nice 23.5 incher. Please excuse the NY Giants sweatshirt I am wearing. I have designated it for wiping fish guts and slime on - so it will officially be my garbage hoodie. But I agree, no self respecting Cowboys fan should be caught dead in a Giants sweatshirt! We were back home by 8:30am and it felt like we had already had a full day. The rest of the family was just waking up. I gave 3 nice fluke to Brad and kept 4 for myself. More fluke to clean! I left my fish in the livewell on the boat with the aerator pump on all day. My objective was to keep them alive while I was at work and then make up a nice ice water cooler to chill them in overnight. This was a big mistake. When I returned home from work (8 hours later) I found only one of my fish still alive in the tank. The others had died and without the ice to chill and preserve them, they had been sitting out in a warm water bath all day long. Not good. I attempted to chill them all, despite a slight funky smell that the dead ones had. My gut is telling me that these 3 fish are just not going to cut it. We'll see tomorrow when I get the knife out. I feel bad but I only have myself to blame. If these fish go bad then I will chalk it up to a learning experience and try to not make that same mistake again in the future. I brought some Honey Bits into work today to offer to my co-workers as a sample tasting. Almost everyone enjoyed them. You just can't please all of the people all of the time can you? I packed a nice lunch of, you guessed it, fluke, asparagus and rice in a tin foil pack to be broiled in the toaster oven. It was a long, tiring day and I suffered some lower back pains on occasion. I'm not sure why I had the pain but I'm sure I was tired because I was up at the crack of dawn and going non stop all day long. For dinner I enjoyed my first salad of the season - right from the garden. I also managed to pick yet another helping of asparagus. Did I mention that it seems like a never ending asparagus crop? Man, they just keep on coming. I should post some photos of the garden soon. It's really starting to change now. It's amazing what can happen in a few weeks. It was good to get some greens tonight. Always nice to have fresh garden veggies during the SDC. I also enjoyed a small plate of fluke sushi. It's a very mild fish when it comes to sushi and sashimi preparations. I can't really rave about it but it's easy to make and a nice treat. Another long day in the books. I may have another fish fry in the near future because my supply is growing again. That may depend on the quality of the fish tomorrow. The weather is turning lousy again starting tomorrow afternoon so I'm glad I had time fish today despite being a work day. As long as I'm not lazy, and the tide is right, I can get a couple hours of fishing done in the morning before work. Pretty cool.